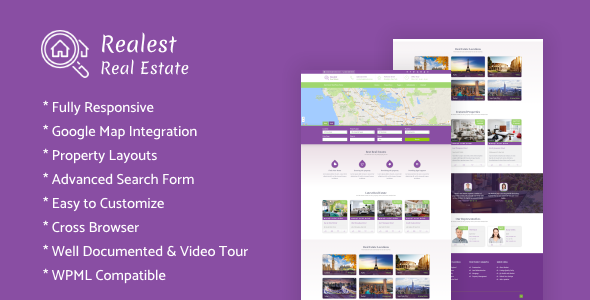 Realest is a Real Estate WordPress theme designed for real estate agencies, agents and property owners. You can also use this theme as a corporate page. The homepage has many sections: full width slider, comprehensive property search filters, locations, testimonials and other necessary options to present information about the services you provide. With Realest – Real Estate WordPress Theme users can manage their own properties without accessing admin dashboard. They can manage their profile, password and property listing. You can add as much agent as you need for a property. By using Realest you can start charging your users and earn money. We prepared for you theme with strong monetization focus. Pay per post and packages are industry standard but you can use our new “extras” earning tools (including pay per featured or pay for TOP) to increase your monthly wage. Combination of monetization and our statistics makes ApusHome a powerful theme. It has a fully responsive width adjusts automatically to any screen size or resolution. Realest allows your users to add properties by themselves. By using submit property menu, users will handle their properties with handy and beautiful front-end submission page. Users with the necessary authority can manage their properties from WordPress admin dashboards. Users can bookmark any properties by this theme without any limitation. With Realia plugin you are able to assign agents to properties and create agencies grouping agents. You can manage all fields and sections of every search property forms of your website. You can search by geographical location, number of bedrooms and bathrooms, type of property, price, property size, and many more search fields. Realest theme is fully flexible. You can add your local currency with few clicks only. You can select which currencies to display and this allows your customers to see your products’ prices in their selected currency. Realest offers incredible and easy to use theme options. All theme options can be easily setup using live customizer. This allows you to display Google map with properties markers on the search results page, front page, properties detail and display webpages.